Welcome to the home page of Roy Innes, west coast mystery author. On this page, you'll find an up-to-date view of what Roy is currently writing, how to get in touch with him, and how to order his books. In general, this is where new announcements will go, news, upcoming releases, and anything else which is considered relevant. January 4, 2019 A new year begins and reminds Roy that he has been neglecting his website (but not his writing). One of his short stories was a winner in a recent international competition put on by Exisle Publishing, New Zealand-Australia, and will be published in the 2020 book Love and Loss, a Collection of Short Stories. Also since his last posting, Roy completed and has submitted for publication: a young adult novel, a crime fiction novella, a stage play and Inspector Coswell has reappeared on his computer screen as number five in the series evolves. March 31, 2017 BC BookWorld's James Paley's review of The Extra Cadaver Murder has been posted. To see it, either click on the 'Reviews' button on the left, or click here. January 7, 2017 Margaret Cannon's Globe and Mail review has been posted. To read it, either click on the 'Reviews' button on the left, or click here. December 15, 2016 Another review of The Extra Cadaver Murder has shown up, this time from an active-duty RCMP officer. To read it, either click on the 'Reviews' button on the left, or click here. December 4, 2016 A couple of reviews of The Extra Cadaver Murder have shown up. To read them, either click on the 'Reviews' button on the left, or click here. 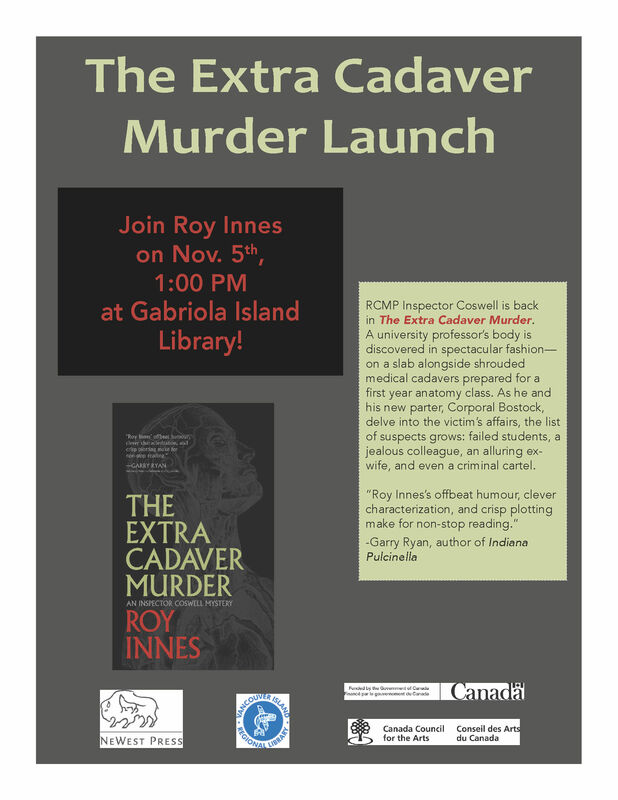 November 5, 2016 Roy launched the fourth in this Inspector Coswell series, The Extra Cadaver Murder, at the Gabriola library to a capacity crowd. Phyllis Reeve started off the event with her usual humourous introduction and Roy's subsequent discourse on the trials and tribulations of writing crime fiction was well received. 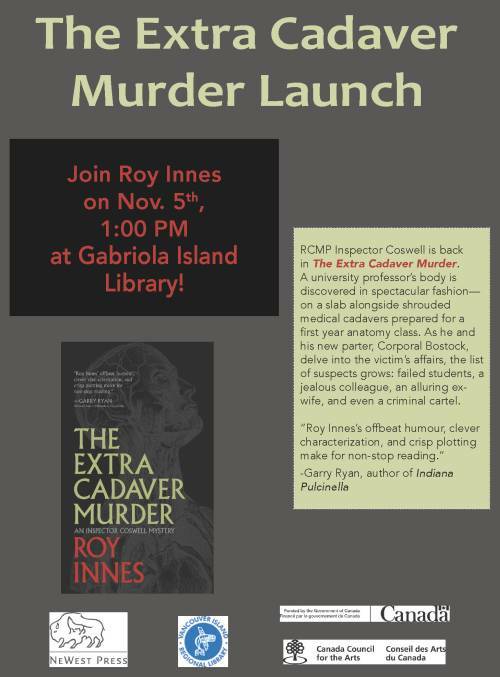 October 12, 2016 NeWest Press is proud to present the release of our penultimate book of the Fall 2016 season: The Extra Cadaver Murder by Roy Innes. This mystery novel - which has been praised by Garry Ryan - will be available on store shelves and online on October 25th and is the fourth edition of the Inspector Coswell of the RCMP series. 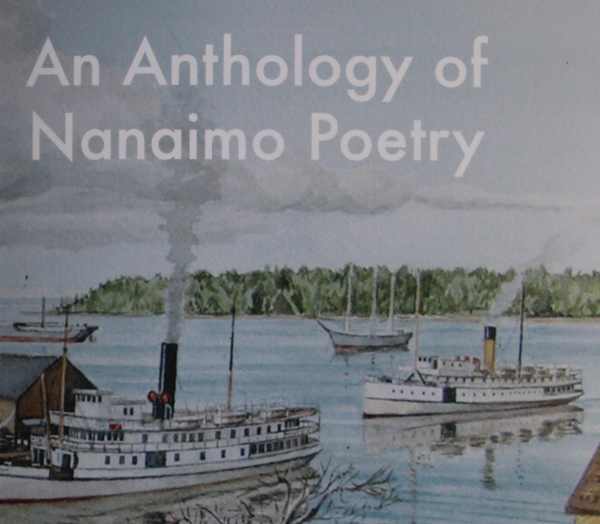 Innes will be celebrating the launch of this book with an event on Gabriola Island, BC, at Gabriola Island Public Library on November 5th at 1 pm. Also, for a chance to win a copy of The Extra Cadaver Murder, enter the Goodreads Giveaway before November 3rd! To read a short synopsis of The Extra Cadaver Murder, visit the novels page. September 13, 2016 Finally, an official release date from NeWest Press for Roy's latest novel, The Extra Cadaver Murder--October 25th. For those interested, there will be a launch event the following week. The event will be held at the Gabriola Island Library at 1pm on November the 5th. August 31, 2016 Problems with printing have delayed the release of Roy's latest novel, The Extra Cadaver Murder, but it's back in the mill again. Notice of copy availability, date and time of launch will appear in subsequent post. 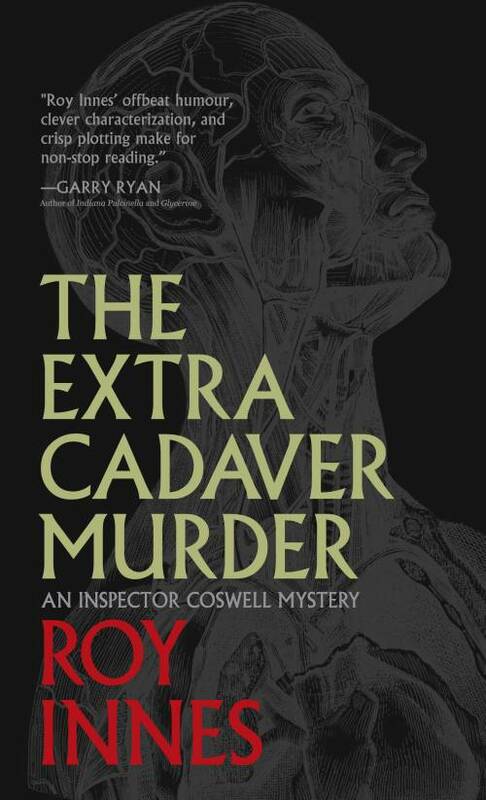 June 8, 2016 Here is the cover for The Extra Cadaver Murder, the latest in Roy's Inspector Coswell series, due for release by NeWest Press in October of this year. In the novel, Roy has drawn upon his considerable years in the Vancouver medical scene, both clinical and academic, to provide not only the setting but the basis for some interesting characterization. January 21, 2016 The NeWest Press wheels have started turning again on Roy's latest in the Inspector Coswell series, still tentatively titled The Extra Cadaver Murder. It will definitely be released this fall. Roy is working with board editor Don Kerr and NeWest Press staff to complete the final manuscript checks and decide on the book cover design prior to printing. August 28, 2014 Hooray! After a long hiatus (and many false starts) Roy has finished the fourth in his Inspector Coswell series, tentatively titled The Extra Cadaver Murder. A chance email to Roy from a former patient inspired the creation of a whole new character who sorely tests the inspector's trademark self confidence. The manuscript was received favourably by NeWest Press and is on their to-be-published list. The date will be shown here when it becomes available. October 5, 2012 Roy has once again reached the semifinals of the Kenneth Galbraith Literary Award competition with his short story, The Last Ride. To go to the 2012 semifinals page, click here. May 6, 2012 Roy is interviewed along with fellow mystery novelist Deryn Collier on Sheryl MacKay's CBC Radio One program North by Northwest. Listen to the interview here. August 3, 2011 Another interview for Roy, this time with author Jill Edmondson on her Sasha Jackson Mysteries blog. Read the interview here. 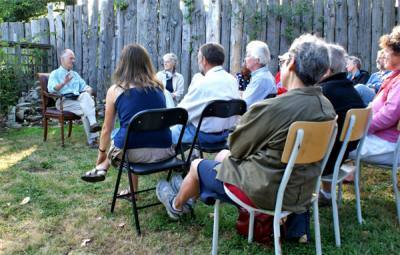 July 21, 2011 Roy has been interviewed by Jo-Ann Roberts on CBC Radio's All Points West program. You can go directly to the CBC All Points West Summer Mystery Book Series for July 21 here. Or, if you prefer, you may listen to the podcast of the interview here. June 8, 2011 Roy responded to Nigel Bird's request for an interview on his blog Sea Minor. The interview is available here. May 30, 2011 A new review of Murder in the Chilcotin by columnist Betty Webb of New York City's Mystery Scene Magazine is now available. To read the review, either click on the 'Reviews' button on the left, or click here. May 12, 2011 Roy took part in the inaugural Read Dating event at the main branch of the Vancouver Public Library. 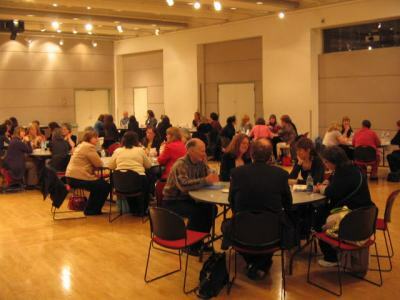 Librarians from the lower mainland had the opportunity to have ten-minute sessions with authors of different genres seated at different tables in the Alice McKay conference room. 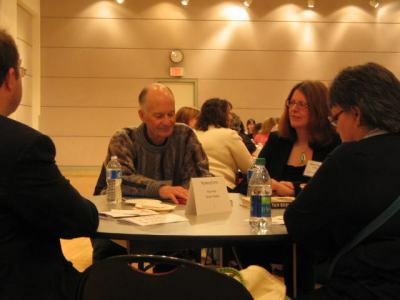 Roy sits with historical mystery novelist Sharon Rowse at the 2011 Vancouver Public Library Read Dating event. The 2011 Vancouver Public Library Read Dating event was held in the Alice McKay conference room at the Vancouver Public Library. April 12, 2011 It was mystery night for "At the Mike", an event at the Fort Street Cafe in Victoria, BC. 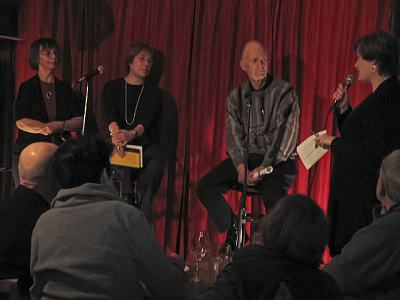 Roy and two fellow crime novelists -- Kay Stewart and Debra Purdy Kong -- presented their latest novels and took part in a lively, audience participation question-and-answer session moderated by Ruth Linka, publisher of Touchwood Editions. Touchwood Editions was the sponser for the evening. Roy addresses listens to moderator Ruth Linka at the 'At The Mike' event at the Fort Street Cafe in Victoria, BC, on April 12, 2011. February 14, 2011 Another review, this time by Don Graves of the Hamilton Spectator. You can read a copy of the review in the reviews section of this website, reachable on the left or by clicking here. February 13, 2011 George Szanto has reviewed Murder in the Chilcotin. You can read a copy of the review in the reviews section of this website, reachable on the left or by clicking here. January 16, 2011: Reviewer Wayne Gunn has posted a review of Murder in the Chilcotin. You can read a copy of the review in the reviews section of this website, reachable on the left or by clicking here. 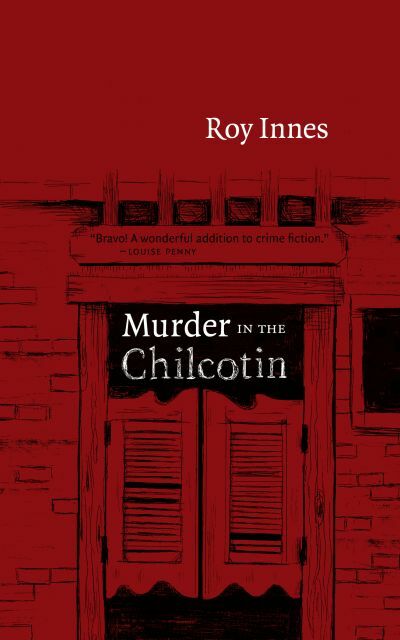 December 4, 2010: Notable mystery author Lou Allin reviews Roy's new novel, Murder in the Chilcotin. You can read a copy of the review in the reviews section of this website, reachable on the left or by clicking here. December 1, 2010: An article on the predilection of Gabriola Island's residents to write detective stories has been posted to British Columbia's Senior Living Magazine. You can read the article by clicking here. November 19, 2010: NeWest Press has published a podcast of an interview Roy did with general manager Paul Matwychuk. Click here to follow a link that goes directly to the podcast (.mp3 format). November 18, 2010: Roy gets noticed by the Globe and Mail's crime and mystery book reviewer Margaret Cannon. She's done a book review of Murder in the Chilcotin, and you can read it by clicking on the link here (look for the fourth review down on the page). 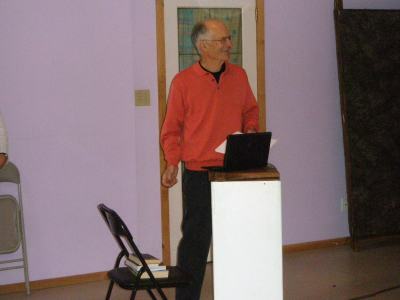 October 31, 2010: Roy launches the third in his Inspector Coswell series, Murder in the Chilcotin, at Antony Holland's theatre on Gabriola Island. Sixty-six mystery fans filled the seats and enjoyed his presentation. Photos of the Chilcotin taken on his many hunting trips to the area enhanced the snippets he read from the novel. Questions followed that ranged from writing techniques to personal anecdotes by audience members who were very familiar with Cariboo life. 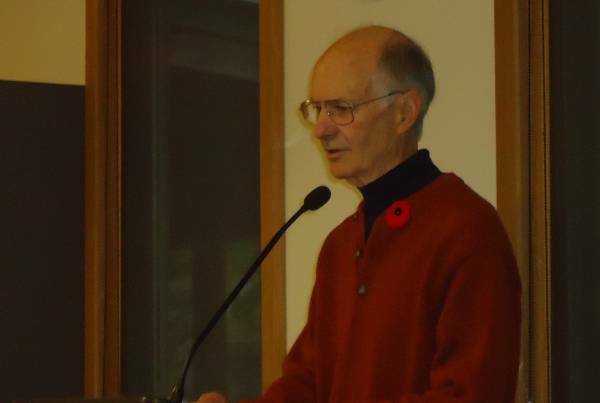 Roy addresses the mystery fans at the Antony Holland theatre on Gabriola Island, October 31, 2010. 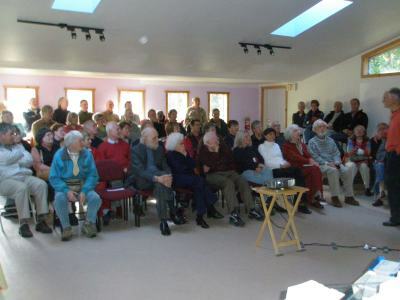 Roy presents a Chilcotin-themed slideshow to fans at the Antony Holland theatre on Gabriola Island, October 31, 2010. September 11, 2010: Murder in the Chilcotin is almost ready to go to press. The cover is done, the blurbs written and the launch date is set--October 31st, 2010 at The Centre on Gabriola Island from 1 to 3pm. September 1, 2010: Roy was one of the finalists in this year's Burnaby Writers' Society annual contest.The challenge was to pen a single page on the topic "Water." Almost all entries were poems but Roy managed to squeeze a short story into the space titled 'Preserving the Staff of Life'. You can read the short story here. 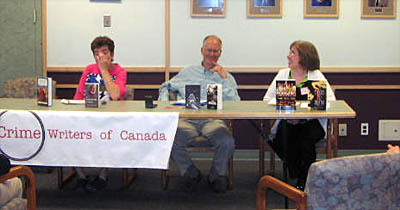 April 22, 2010: Roy was at the Central Vancouver Public Library taking part in a panel discussion with other B.C. crime writers. The event was titled "Coastal Crime Wave - an evening at the Arthurs." Click here for details. Moderator - Marsha Lederman from the Global and Mail. Panelists - authors Anne Barton, Phyllis Smallman, Juanita Rose Violini, Joan Donaldson-Yarmey, Roy Innes. December 21, 2009: New Novel Coming Soon! Roy's third novel in the Inspector Coswell series has been accepted by NeWest Press and is slated for release in the fall of 2010. Tentatively titled The Chilcotin Murders, it follows Coswell and Blakemore as the two Mounties investigate the killing of a young rookie officer in the wilds of B.C. 's Cariboo country. October 22, 2009: Roy's short story, Sheila Pritchard, reached the final three in the Kenneth Galbraith Literary Award competition. Winner was Judy Millar from Nanaimo, B.C. Congratulations, Judy. Click here to go to the 'stories' section on the award's website to view the listing of the top twelve submitted stories. A link to a pdf document containing Roy's Sheila Pritchard is available from there. October 4, 2009: A short story Roy submitted to the John Kenneth Galbraith Literary Award has made it to the semi-finals! Click here to view the semi-finalist list. Click here to read more about the award. September 28, 2009: Roy is now a member of the committe responsible for Bloody Words 2011, which will be held for the first time in Victoria (Toronto and Ottawa have done it for years). 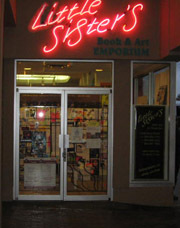 Visit the website at bloodywords2011.com. 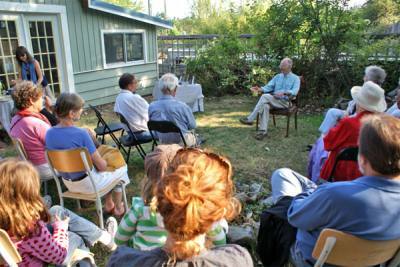 Roy Innes and fans at the Galiano Island Books event. 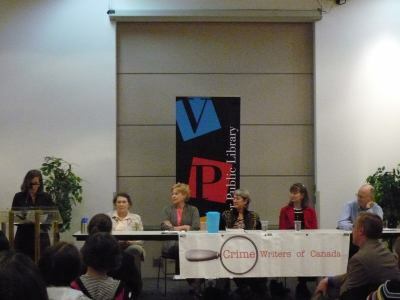 May 30, 2009: Roy took part in a Crime Writers of Canada all-day event titled "A Coastal Crime Wave Comes to the Greater Victoria Public Library." The sessions were well attended with much give and take from the largely writer audience. Roy's panel was charged with discussing the topic "Sin and Salvation: Dos and Don'ts of Crime Fiction." Nicola Furlong, Church Choir Mysteries, and Debra Purdy Kong, Fatal Encryption, were co-panellists. 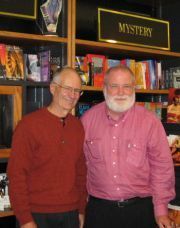 October 16, 2008: Roy and Garry Ryan at Little Sister's Bookstore in Vancouver's West End, setting for Roy's latest novel. Attendees who braved the dark and stormy night were treated to a lively presentation by the two NeWest Press authors, discussing their novels and crime-writing in general. September 28, 2008: Roy attended Word on the Street in downtown Vancouver. At the large event, which blocked off an entire street, Roy read from and discussed about his second novel, West End Murders. May 25, 2008: The launch of Roy’s latest novel, West End Murders, was a great success. 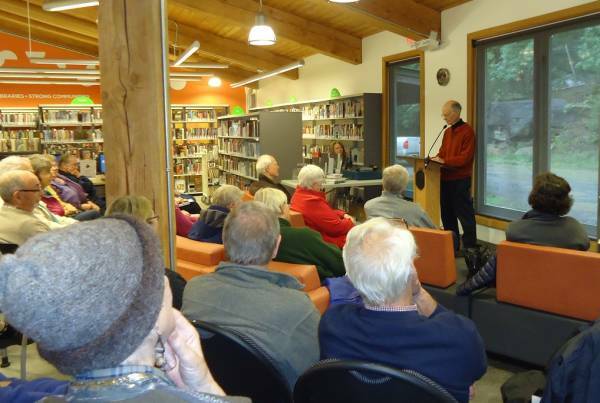 Islanders filled the Gabriola Theatre Centre, a local landmark, to hear his talk about the novel and the ups and downs of crime fiction writing. The reception and signing afterwards, typical of island events, went on and on with good humour and much conversation. A truly fun event. 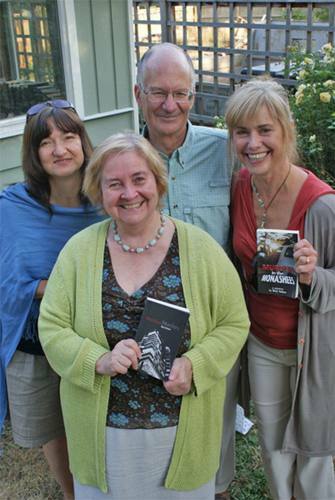 April 24, 2008: For those of you interested and able to attend, the official launch of West End Murders will be at The Centre on Gabriola Island on May 25th. Click here to go the promotions page for more details. April 4, 2008: Jo-Ann Roberts of the CBC Radio program All Points West interviews Roy about his latest novel, West End Murders. Click here to listen to the interview [note: audio only, and requires you to have an audio player on your computer than can play RealAudio files]. January 8, 2008: West End Murders is to be published in the spring of this year! West End Murders is the second in the series that started with Murder in the Monashees, focusing on the work of RCMP Corporal Blakemore and Inspector Coswell. While Murder in the Monashees is set in the village of Bear Creek, West End Murders transports the characters to the metropolis of Vancouver, where they not only deal with a local crime spree but also a national conspiracy that threatens the life of a United States politician. Check out the 'Coming Soon' section for more details! June 1, 2007: The new novels are coming along! For more information, go to the 'Coming Soon' section. January 2, 2006: This webpage is now accessible via royinnes.com and royinnes.ca. December 28, 2005 : Two new novels are in the works. For more information, go to the 'Coming Soon' section. December 25, 2005 : Merry Christmas! The creation of this homepage for Roy Innes is the news for today!